3. That there is no public uprising. General Rule: Direct assault is always complexed with the material consequence of the act (Ex. direct assault with murder). Exception: If resulting in a light felony, the consequent crime is absorbed. The force employed need not be serious when the offended party is a person in authority (Ex. Laying of hands). The intimidation or resistance must be serious whether the offended party is an agent only or a person in authority (Ex. Pointing a gun). A person in authority is any person directly vested with jurisdiction (power or authority to govern and execute the laws) whether as an individual or as a member of some court or governmental corporation, board, or commission. Examples: A barangay captain, a Division Superintendent of Schools, President of Sanitary Division and a teacher. An agent is one who, by direct provision of law or by election or by appointment by competent authority, is charged with the maintenance of public order and the protection and security of life and property. Examples: Barrio councilman and any person who comes to the aid of the person in authority, policeman, municipal treasurer, postmaster, sheriff, agents of the BIR, Malacañang confidential agent. Even when the person in authority or the agent agrees to fight, direct assault is still committed. When the person in authority or the agent provoked/attacked first, innocent party is entitled to defend himself and cannot be held liable for assault or resistance nor for physical injuries, because he acts in legitimate self-defense. There can be no assault upon or disobedience to one’s authority by another when they both contend that they were in the exercise of their respective duties. When assault is made by reason of the performance of his duty there is no need for actual performance of his official duty when attacked. Direct assault may be committed upon a private person who comes to the aid of a person in authority since he is then considered an agent of a person in authority. Classifications of direct - simple and qualified. The first form of direct assault is tantamount to rebellion or sedition, except that there is no pubic uprising. When the assault results in the killing of that agent or of a person in authority, there arises a complex crime of direct assault with murder or homicide. The only time when it is not complexed is when material consequence is a light felony, that is, slight physical injury. Direct assault absorbs the lighter felony. Resistance or disobedience to an agent of a person in authority is always serious, but to an agent of a person in authority, it may or may not be serious. 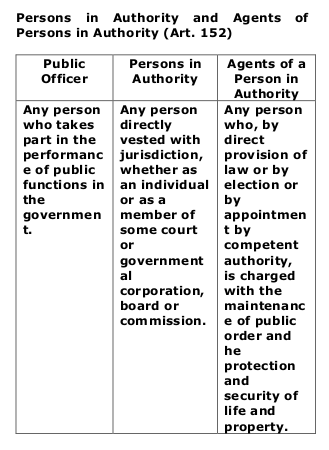 If the public officer is not a person in authority, the assault on him is an aggravating circumstance in Art. 14, no. 3 (rank). Teachers, lawyers and heads of schools recognized by government are persons in authority only for purposes of Art. 152 in relation to Arts. 148 and 151, and in connection with their duties. A person in authority includes a barangay chairman and members of the Lupong Tagapagkasundo as provided under the Local Government Code.